With less than 100 days to go until the election, Republican presidential nominee Donald Trump returned to New Hampshire on Saturday to rally supporters. 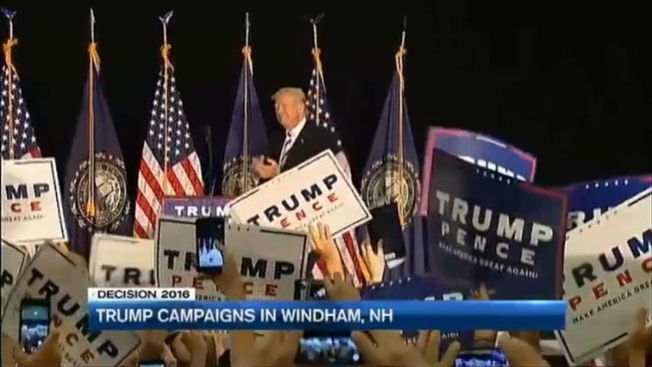 Trump spoke at about 8:30 p.m. at Windham High School after an introduction by former Massachusetts Sen. Scott Brown. During his speech he talked about the national heroin crisis and took jabs at Hillary Clinton. Trump's appearance marked his first public rally in New Hampshire since the state's February primary. He returned to New Hampshire on two other occasions, but both times he held small, private events rather than the gymnasium rallies that have become a staple of his campaign. The businessman's return to the state comes several days after he criticized New Hampshire's Republican U.S. senator, Kelly Ayotte, and declined to endorse her. But he reversed that position on Friday. Donald Trump supporters lined up hours in advance for his rally on Saturday in Windham, New Hampshire. Supporters lined up hours before Saturday night's rally to see the man they believe should be president. "I'm a huge supporter of Trump," said Jennifer Axon, of Westfield, Massachusetts. "I think the corruption has to stop and I'm here to make history go down. To watch it go down." A new poll from WBUR shows that Trump is lagging behind Hillary Clinton with 47 percent of New Hampshire voters supporting her over Trump's 32 percent. Earlier polls had the two candidates virtually tied. Clinton spent her Saturday campaigning in Las Vegas. When necn asked Trump supporters how they felt about the state of the campaign, most felt fine. "I'm trying not to feel concerned," said Axon. "I think he's got a plan. I think he's going to be just fine." "I've been supporting Donald Trump since day one and his vulgarity is just a small sacrifice for what he wants to get done, and he's going to get done what a lot of people want, and he's going to bring the change that's needed for the country," said Jacob Fararr, of Barrington, Rhode Island. Al Marrone of Sandown, New Hampshire said he believes Trump is the only person who can help small business owners like himself. "In 2009, I was laid off from a financial firm and I had to open up my own company," said Marrone. "I'm not making the money i used to." He said his future will be better off with Trump in office, rather than with Clinton. The crowd of supporters started lining up outside the high school around 12 p.m. People had to be turned away at the door because the venue was at capacity. There were only 5 reported protesters at the event.